Just to be thorough, here's my Sunday prior to the speed dating event: woke up at 8:30am, went for a run with my neighborhood buddy, Romeo. We ran the beautiful path next to the stream in my neighborhood. It was a great first workout to get myself back in the routine! Next, I got my hair cut in the neighborhood (took a chance with someone new). Turned out okay, but only after I came home and rewashed and styled my hair (they did NOT do a good job!). After that I cleaned my apartment, made some lunch, then headed to church. Church was amazing, but I had to leave a bit early so I could meet Meghan in Gangnam. I arrived right at 6pm, we got some food and then headed to Chicken 'n Chips which is the restaurant where the event was going to be held. We walked in and there was about 25-30 people scattered around just sitting and talking. We looked around awkwardly to see who was in charge. Seeing no one that looked like they were heading things up, we took a seat next to two girls who looked friendly. Finally around 6:45, someone came in and started actually getting things organized. The registration was supposed to have been at 6:30, so that dates could start at 7. Well, we didn't even finish getting everyone registered until 7:40, so needless to say things started quite late! 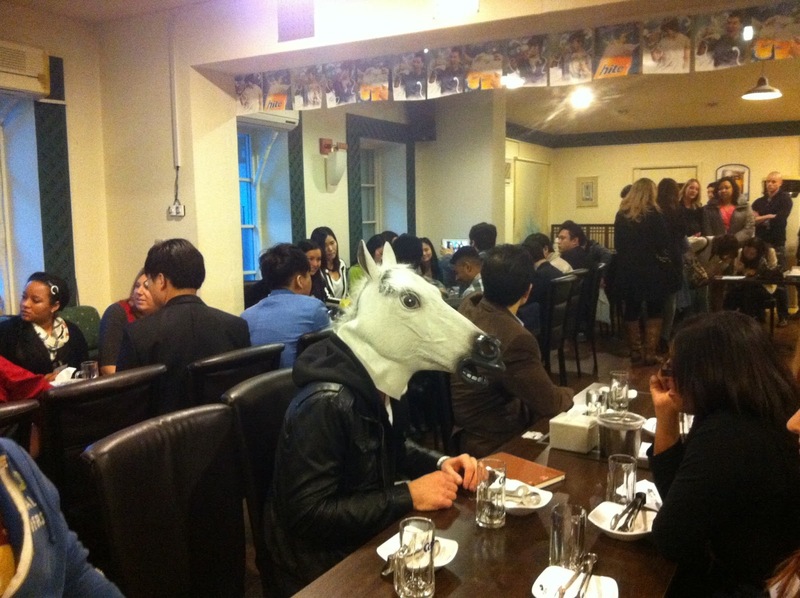 One more thing worth noting: there was a guy who was there when we came in wearing a horse mask. Like in Gangnam Style? Yeah... he was kind of the talk of the room. Like, why is this guy doing this? - annnd a white guy with a horse mask on. Who, I actually had a lot of respect for, for having the guts to wear that crazy thing THE WHOLE NIGHT despite some obviously hostile looks and comments from certain people! It was a mixed bag in every way: maybe half and half Korean vs. Foreigners. Some weirdos, some really cool people! There were more girls than guys (thanks to some guys not showing up), so I had some time without dates, which was really nice, since otherwise it was 3 hours of repeated answers to pretty much the same questions! Finally, I got home around midnight and fell into bed. Monday morning came way too quickly! Now, another week is ahead of me... But, Gramma comes in on Thursday night. Yep, my Gramma is pretty cool! I am in the process of cleaning up my apartment and bleaching my bathroom floors to get ready for her! Awesome post. Your Gramma sounds cool. Any ideas where you'll go. Know you'll have fun. LOVE that stupid horses head! I think you are about as adventurous a spirit as you can get without being one of those guys who tries all the "JackAss" stunts! This is a compliment, by the way. I live in Korea and would love to know how you found speed dating. I've been looking for it but can't find anything online. Any recommendations? I think it sounds really cool and fun!